This post is part of a series reflecting on the end of my traditional working life as I prepare for retirement this week. I’ve just started to read the classic Meditations by Marcus Aurelius and it opens with a description of the people who shaped his life. It struck me that I’m gradually forgetting the names of those that shaped mine, so I had better get them written down quickly, they are important to me. Writing this post also provided an excuse for a surprisingly enjoyable ramble down memory lane. Mum and Dad come first, they enabled so much in my life through their unconditional love and support. I was very lucky to grow up without any pressure on me to conform or to perform, I was happy to find my own way and Mum and Dad left me free to do that. They taught me responsibility though and the value of hard work through extensive chores. They taught me that a house should be a peaceful place, that shouting is for emergencies, swearing unnecessary. Dad taught me that there’s always a way to make or fix things and the value of a well stocked tool shed. Mum showed me the value of committing to something, in my case to swimming, even when I often didn’t want to practice. Mrs Clark was the first teacher who believed in me, I really struggled in primary school, found nothing to excel at, until Mrs Clark taught me poetry and was happy with the results, despite my poor grammar and spelling. I went on to win several city level poetry competitions although spelling and grammar have never been conquered. An un-named careers teacher who took me to hospital after I had a door slammed on my finger at school. He gave me a one-to-one career counselling session that’s burned into my mind, it’s because of him that I trained as a mechanical engineer, rather than as a car mechanic, met Debbie, and ended up in IT. My mostly useless GCSE teachers, I was in low sets at school until sixth-form, so the quality of education I got was very poor. As a result I was forced to learn how to teach myself, which made me very self reliant and started me on my maverick path in life. The Key Facts books taught me everything I needed to know to do pretty well in my GCSE’s and from then on was considered something of a high-flyer which was quite a change after the previous 10 years of being largely ignored, unfortunately I never learned grammar! Gary Beckett and Rob Blythe who together believed in me and gave me the freedom and support that I needed to keep working and making a difference for the last 10 years despite chronic illness and both became great friends. Together we re-shaped many an organisation and they gave me the opportunity to have a lot of influence without the stresses that come with accountability. Stu Downes who made the last decade of my working life fun, through his friendship and his open approach to collaboration. I liked nothing better than sitting down in front of a stack of A3 paper and brainstorming, designing and plotting with Stu. Graham Chastney who was my trusted advisor and friend for longer than I care to remember, whenever I was unsure about anything in work, life or technology I turned to Graham. Graham has been working with me or close by me for 2/3 of my working life! Deciding on the short-list of people has been a real struggle, for example I decided to include only the people who shaped me through real world interactions, rather than people I watched on TV, or read about. There are so many other people I could mention and as I write this names keep popping into my mind, it’s a good job I ran out of time. What’s really missing from this list though are the hundreds of thousands of people that I was working for, the people who used the systems that I architected and designed, the people who’s lives I was trying to make more effective and fun. Perhaps most importantly were the teams that I worked with, who I tried hard to provide with a rich learning experience, good working conditions, the opportunity to build something great and have fun doing it. Unfortunately several of the people on this list have now died and I frequently regret that I never took the time to thank them, for the rest – THANKS VERY MUCH! 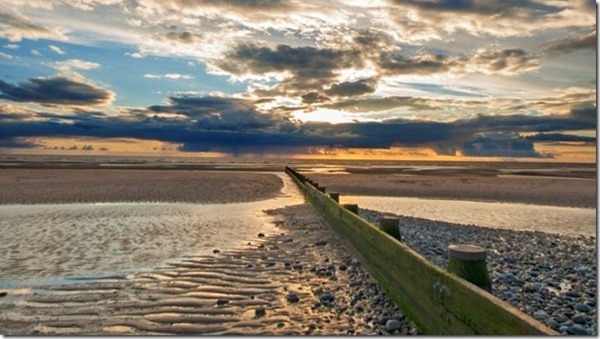 The photo is of Cleveleys beach, I was raised ‘on’ the beach and will probably always live near water. A lover of wide open spaces, wonderful views and crashing waves more than anything else this defines who I am deep down, a humanist and a lover of the natural world. All the comments on this post ended up on Facebook, so I’ve copied them over here, I’d hate to loose these kind words! Jack M. Oliveira, Darren McComas, Martin Fryatt and 15 others like this. Martyn Dews That’s a lovely post Steve. Steve Townend You are so right to record names before you forget. Only yesterday, I was trying to recall the name of a CSC colleague and had to revert to an archived copy of some old code in order to remember him. Is it just me but I seem to remember IP addresses better than peoples names wink emoticon You described people that inspired you but you, of course, inspired others. I was often so deep into software that I needed to follow in someone’s slipstream in order to advance my career. You provided plenty of inspiration and caused a huge slipstream capable of carrying several people along with you. I am glad that I was one of those people. You also provided down to earth support outside of work when my personal life threw me a few curve balls. Thanks Steve and I look forward to meeting you again soon. Simon Beare I can only thank you Steve for all the countless opportunities you gave me to unleash my creative side. I enjoyed all those challenges from VOE, to the Windows 8 style PowerPoint presentation templates. You have a rare talent to see people three dimensionally, not just the everyday two dimensional face value that most of us see, but the true depth of talent and knowledge that most of us carry within us but are too often overlooked in today’s busy ‘must get it done now – think about it later’ lifestyles. Rob Blythe Like most Steve, I can safely say that you have inspired me throughout the time I have known you which must be heading toward 15 years! Your ability to deliver when health issues would have stopped others in their tracks is nothing short of incredible. All the best for your retirement which I am sure will be full of fun.